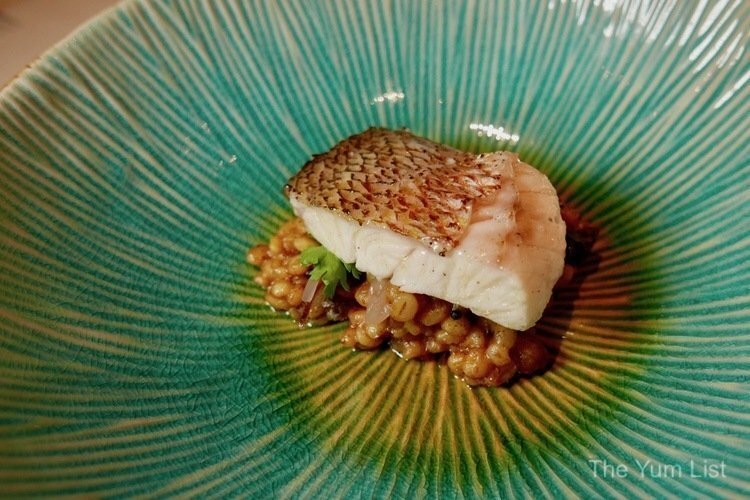 At its core, haute cuisine is about technique, about artistry, about novelty. Marrying culinary precision with new combinations of ingredients supplies diners with experiences that cannot be replicated in a home kitchen. It’s why we love it. 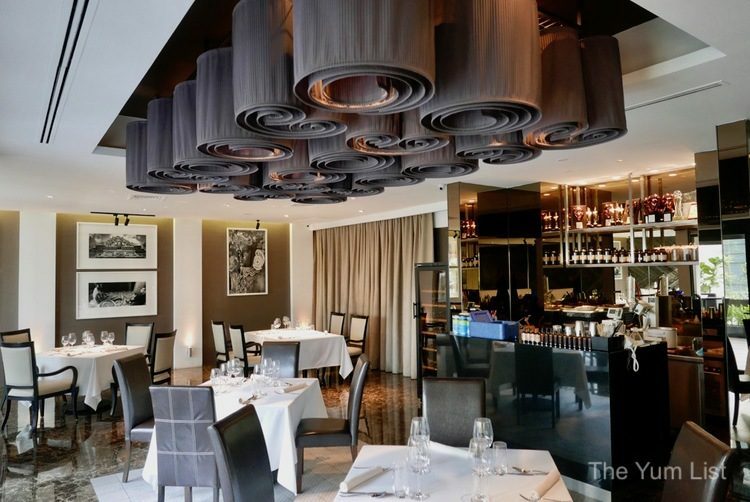 Nadodi, one of our favorite restaurants in the city, has a new menu that wraps everything about haute cuisine in a novel package of its own: Memories. In this round, we get a window into Executive Chef Sricharan Venkatesh’s childhood in Southern India. He says, “It’s about the food I miss eating.” So not only does Nadodi take its guests into the arena of “nomadic cuisine” geographically but we also get the journey of the heart along with it. Nadodi’s renowned mixologist, Akshar, opens the evening with two refreshments for us. I am continually amazed at his creativity and the way he plays around with different infusions to alcohol and unusual ingredients to cordials. 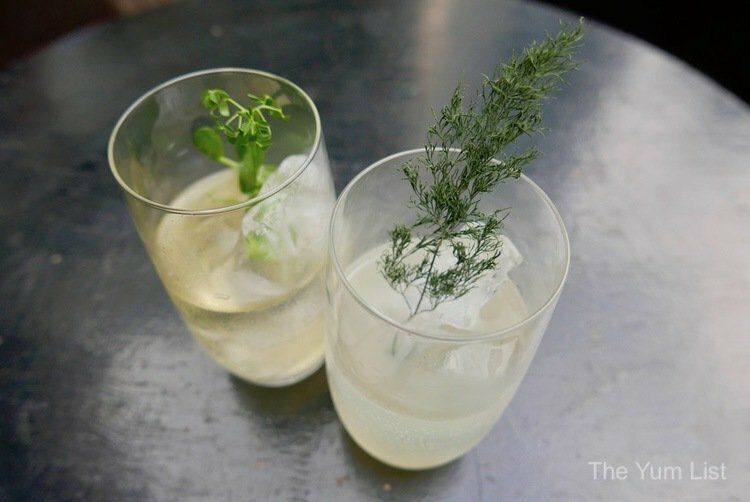 In the first cocktail, we find drumstick-flavored gin (herb from India, not the leg of a chicken!) mixed with housemade tonic water, that is both mild and nicely bitter. Lingering behind is an inkling of curry for a drink that is both warm and cool. 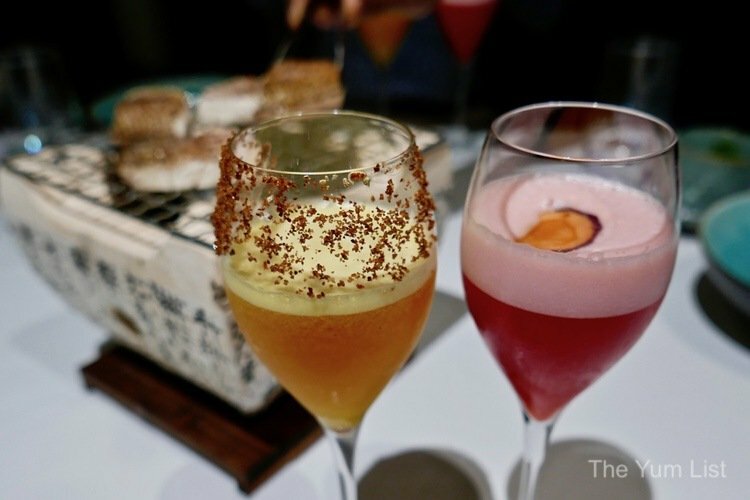 The second, even more unusual, starts with burnt dill rum and blends it with fermented cucumber cordial and aerated water for a cocktail that is sour and sweet, smokey and bubbly. Definitely, a drink to unpack in layers from aroma to finish. I loved the way it sparks up my taste buds in so many ways. Not one to ease guests into the evening’s cuisine slowly, the first course brings not one, not two, but THREE bite-sized experiences. The first resembles a French macaron in deep red hues that reveal the beetroot at the center of the bite. Echoes of tiffin carriers resonate with flavors of curry and chilli inside the meringue, which seems to be made from the air itself, without the addition of sugar or egg. 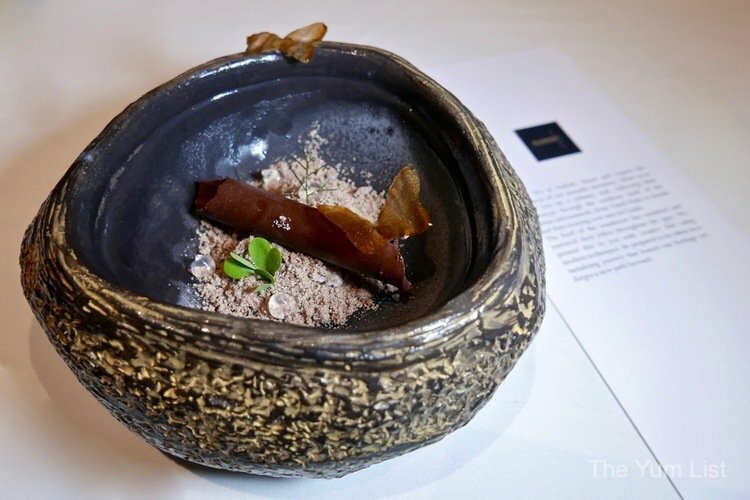 Air returns in the second bite, as a wafer-light shell of puri dissolves into coconut water sweetened with jaggery and richly bound with coconut flesh. Lastly, the unassuming white cube disguises the complex flavors of Chef’s first taste of Malaysian cuisine, enjoyed on his first flight from India! Sparks of sambal around coconut tinder burst into bites of nasi lemak. Hints of chilli knock about the edges of all three, and I can see that I need to buckle my seat belt for the adventure ahead. The course named Duo couples two famous tastes from South India. 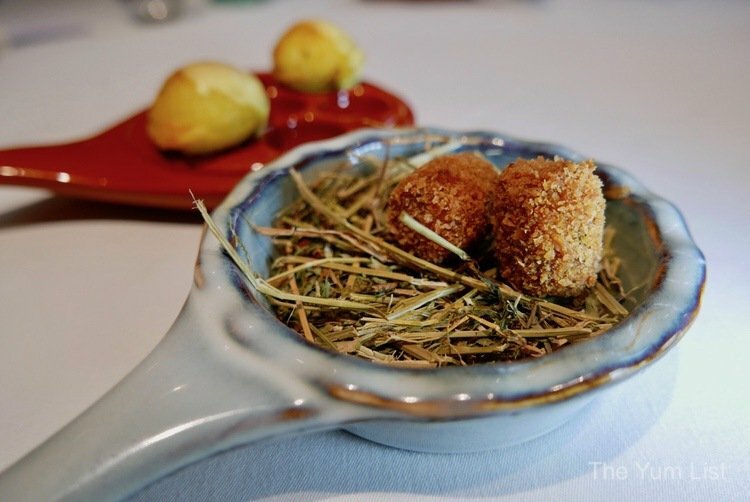 Lying in a nest like freshly laid eggs, we find two miniature croquettes. Commonly found in Kerala, the spirit of Masala Kappa lives inside with a blend of tapioca, beef and onion mixed with regional spices. Nearby, looking like the displaced eggs from the aforementioned nest, chicken mince flavored with onion and coriander are dipped in soured idli batter and fried. Better known as chicken paniyaram, this common snack is served here with a rich cheese sauce drizzled over the top. I used to think that Americans had cornered the market on snacks in their search for culinary distinction. Now I’m ready to move to Chennai! Akshar is back with two more drinks to try. He explains that part of his recent experimentation has been with meat-based cocktails: he now aims to include two in every new menu! 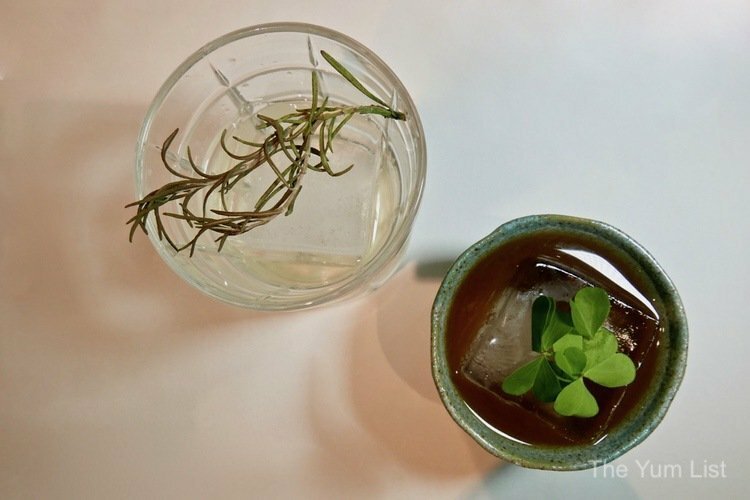 This unparalleled creativity arrives in an ordinary glass with clear liquid; only the rosemary garnish hints of something beyond a pour of gin over ice. 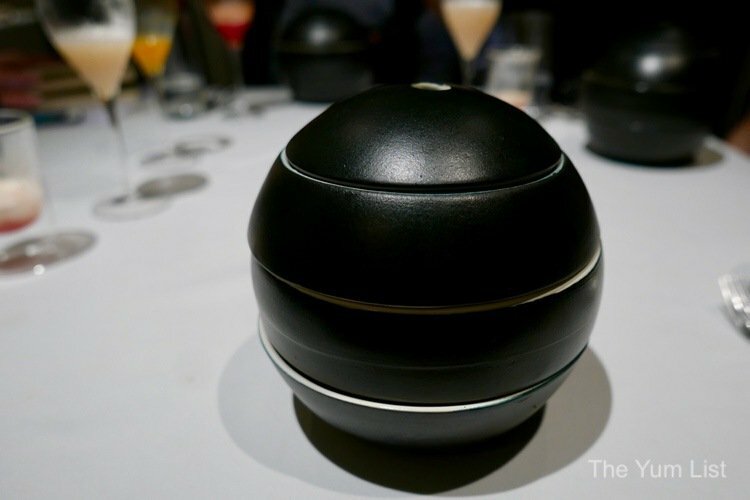 What lies inside is rendered wagyu fat water mixed with rosemary and garlic cordial and vodka. With a spray of pepper vinegar on the top, I’m ready to abandon the knife and fork of Sunday roast at Grandma’s! It’s delicious – in every way, unlike any cocktail, I’ve had, but I’m hooked. A tad more conventional, but no less creative, is the second cocktail: Irish whiskey blended with tamarind cordial and Earl Grey tea, with tiny hints of salt at the finish. The smooth and sweet tamarind tang is a perfect complement to the whiskey. From a family of whiskey drinkers, I’m kind of in love with it. And if the first drink was to displace Grandma, then this one might supplant Grandpa’s weekend whiskey sour. These two take ‘liquid dinner’ to a whole new level. The next course on our culinary journey, Bakery Memories, arrives with a love letter. Truly. On the tray, Chef Sri explains a scene from his childhood where stops for egg puffs and orange drinks were a daily routine after school. In this upscaled version, egg masala is tenderly wrapped in buttery homemade puff pastry and topped with black sesame seeds. The sauce, made from leftover rasam tomatoes, offers more refined ketchup than the one of his youth. An adorable mug of calamansi soda sits alongside, offering bubbly tangerine as a refreshing cleanse to the palate. Cruising along, the next course, Fennel Affair, is a tribute to a friend. Leisa is an agriculturist living in Cameron Highlands who challenged Chef to create a course around the Indian digestive, fennel. 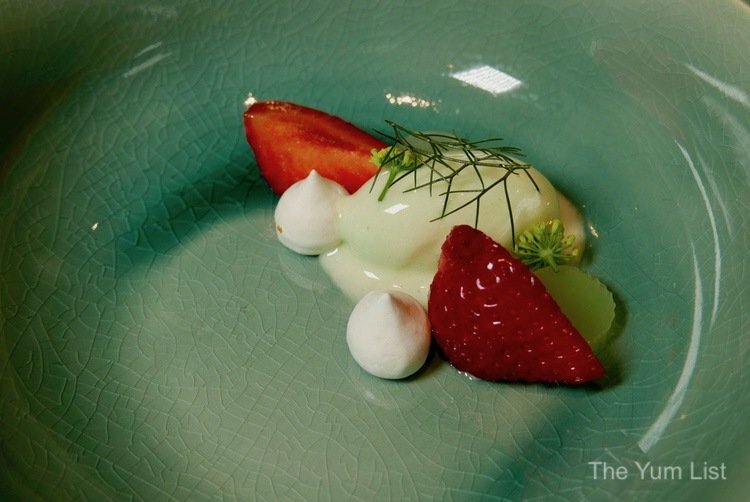 A perfect ingredient for a palate cleanser, a scoop of fennel sorbet arrives, decorated with dollops of lemon meringue, fresh strawberry slices and a sprig of dill. I love the lingering liquorice offset by sweet and tart adornments, and am ready for the range of mains ahead. The next stop on our journey blows my mind. Having made pasta in my own kitchen from eggs, flour, spinach, basil, I have a hard time wrapping my brain around the idea of noodles made from lobster. 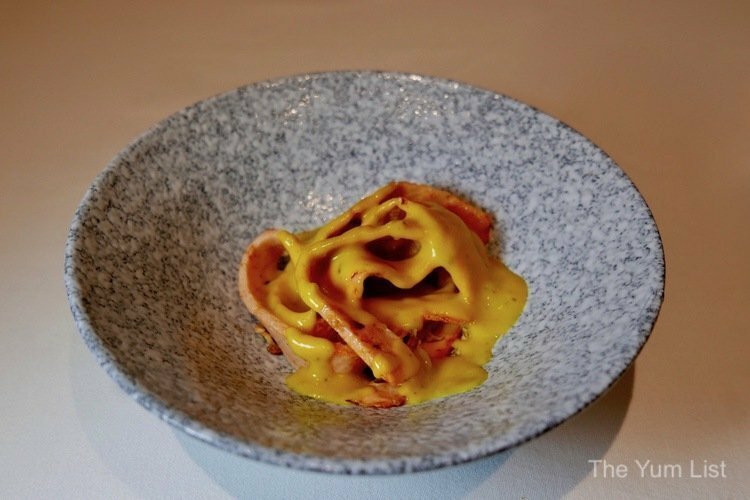 In a beautifully simple ceramic bowl, the course starts with Lobster Ribbon, tail and claw meat pressed into succulent tagliatelle. Keralan Erissery is then poured over the top, creamy pumpkin and coconut sauce peppered with bits of granny smith apple, coconut flakes and fried garlic. 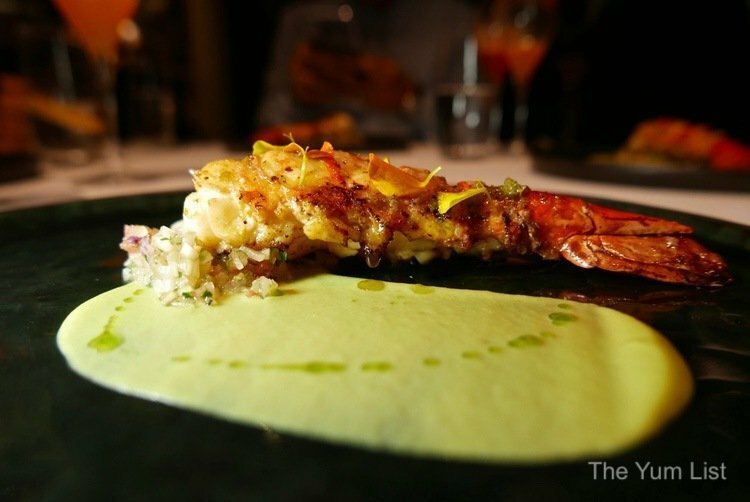 Chef has turned the likes of common banana leaf fare into something lustrous and luxurious. Amazing. Chef describes the next course, Puliogare, as just a ‘little veg dish from home.’ Hmm. What might be humble fare in Tamil Nadu gets dressed up with barley, coconut, sesame oil and tamarind. Peanuts give it a little crunch. The upward mobility continues with a crown of grilled snapper, delivered on its own little barbecue to the table! With a little burnt lemon oil and smoky from the grill, the fish is flaky and moist, an elegant display of earth, smoke and sea. Chef says it’s one of his favorites. Time for more cocktails! Champagne flutes arrive, one pink and one orange to brighten up the table. The pink begins with a base of vodka infused with flax seeds and purple carrot. (I am amazed again by what Akshar combines in a shaker!) With a little bay leaf cordial to edge the intensity of the carrot and a bit of egg white foam, this cocktail is light and bright, a nice complement to the spiciness of the mains. The second flute holds turmeric-infused gin blended with ginger and spice cordial, then shaken with lime and passionfruit. Tantalizing aromas open the first sip – I am always a sucker for anything with passionfruit – and the spicy salt on the edge of the glass adds a spur of chilli to the sweetness of the fruit. The soup course arrives next, called Humble Bisque, a cheeky misnomer as there is nothing humble about this preparation! 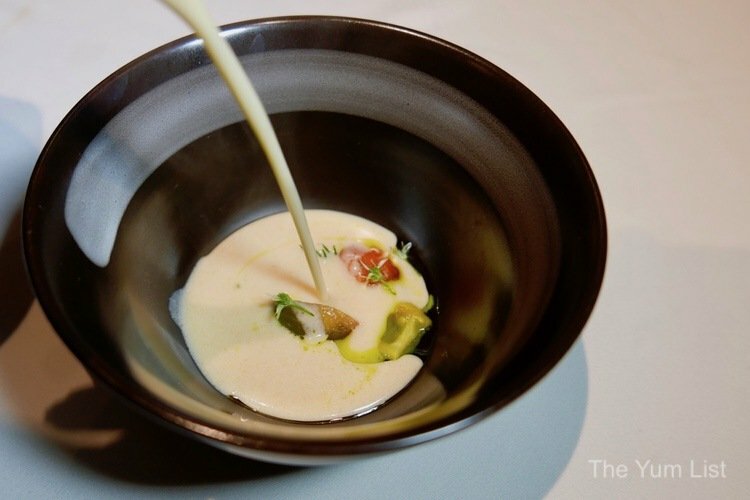 Heirloom tomatoes adorned with fresh dill and curry leaf oil are blessed with almond and garlic bisque, a rich non-dairy cream soup that threads a little rasam tang through each bite. Beautiful. My vote for the prettiest course arrives with I Am So Prawny, a seared tiger prawn topped with edible flowers after marinating in yuzu kosho. Served with green pea curry atop a salad of yacón, this plate delivers citrus, coriander, brine and crunch to one plate with a texture-heavy bow. Under a cover of smoke and glass dome arrives the next course, Pickled Chops. Marinated in a zesty mixture of mango, habanero and mint, these flavorful Spanish lamb chops are melt-in-the-mouth tender and juicy. The pickle at the base of the preparation mingles with pan jus and tangles with the little bit of fat on the seared meat for some of the best lamb I’ve ever eaten. Akshar is back again with a last round of cocktails. Good thing, or we might have to call in sick to work tomorrow! His Hot and Cold concoctions are a delightful surprise to the senses. Here, a cold plum and star anise whiskey blend is topped with warm lemony foam like palate alarm clocks to both taste and temperature. 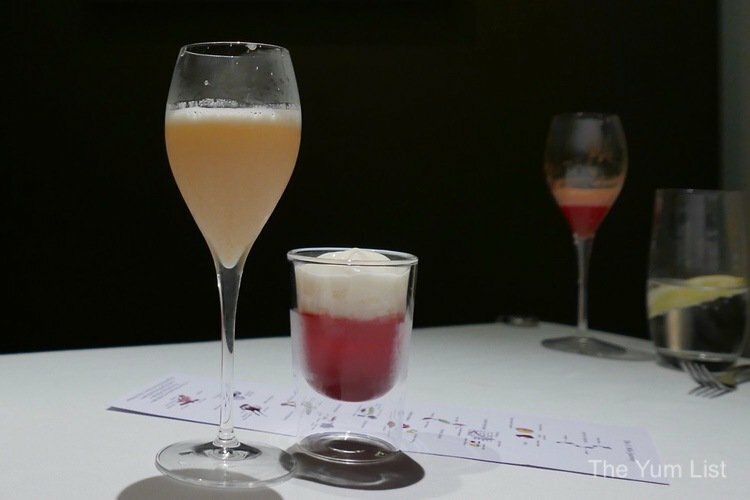 The second cocktail parallels the tang of rasam soup, sweet and sour with lingering notes of tamarind. It’s always an alchemy adventure at Nadodi Restaurant KL. 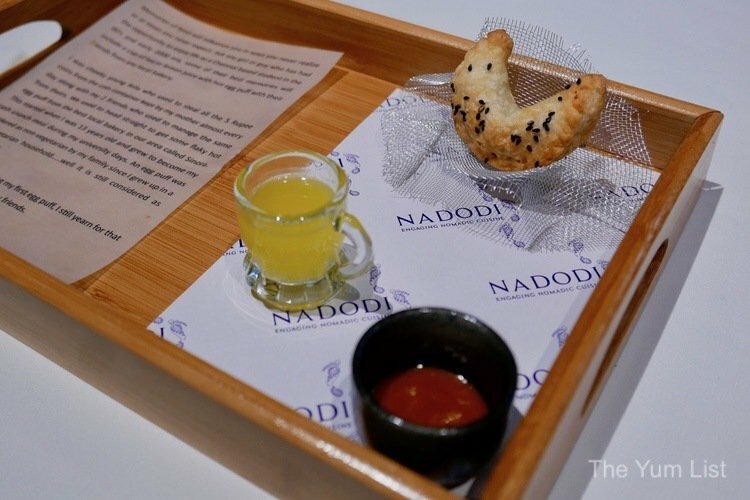 The consistent feature of every Nadodi Restaurant KL journey is the Nadodi Globe to round out the mains. Their own version of biryani, this menu’s rendition conveys several layers of ingredients, beginning at the top with tapioca leaf salad made with sambol and topped with a sago cracker. 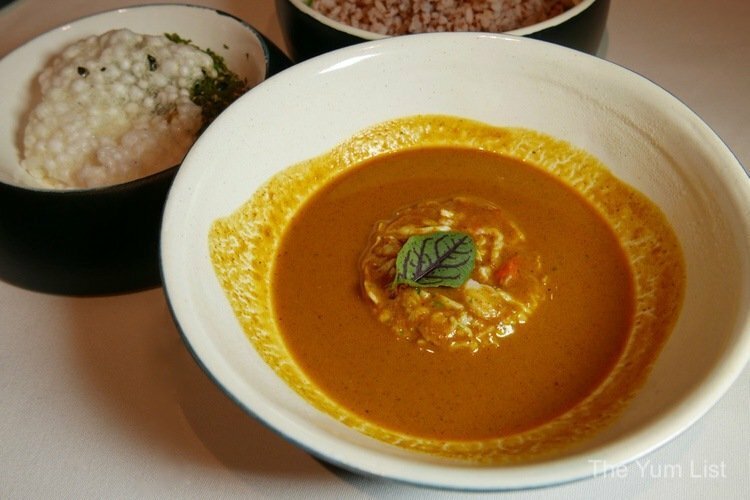 Further down, Indian red rice, known as Palakkadan Matta, lies in wait of Jaffna-style crab curry made with Alaskan king crab. Tempted to savor each layer by itself, Chef advises us to “Eat it like an Indian: Mix it all together!” We consider eating with our fingers, but instead pick up our forks and dive in lustily. Nearing the end of our journey, we arrive at our endpoint: Bhumi, which translates to the element of ‘earth’ in classical Hinduism. An entire terrarium is assembled here, nestled in an ice cold rock bowl. Chocolate soil enriched with cinnamon forms the bed for a log of Valrhona’s Manjari chocolate. Coming in at 64% cocoa, this ‘wood’ is fresh, rich and slightly bitter. Beads of Kelulut honey form pebbles, a scoop of lavender ice cream channel the flowers, and butterflies made from pressed dates add life to the scene. The journeys at Nadodi Restaurant KL are always an adventure, and I’d love to take the staff along as guides every time. But to take a special journey through the childhood of Chef Sricharan is an extra memorable one. Even if you don’t share his memories, it might be time to make some of your own. 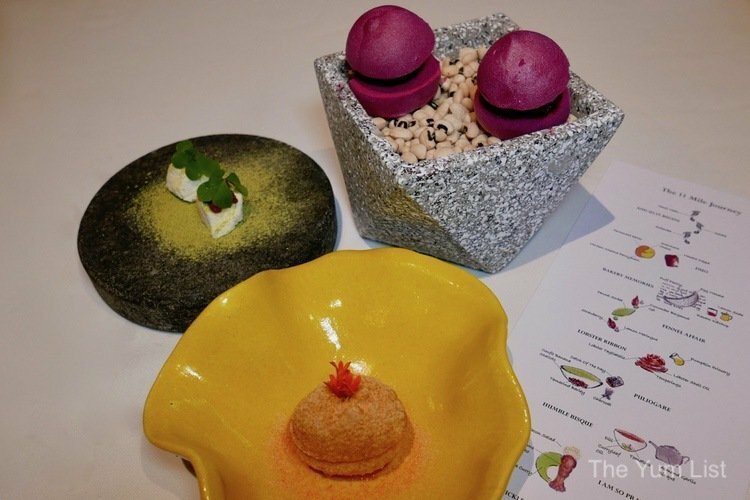 The 11-Course Tasting Menu runs RM490++; a vegetarian option is available for RM450++. Shorter journeys are also available, the 9-course option runs RM430++, and the 7-course RM360. 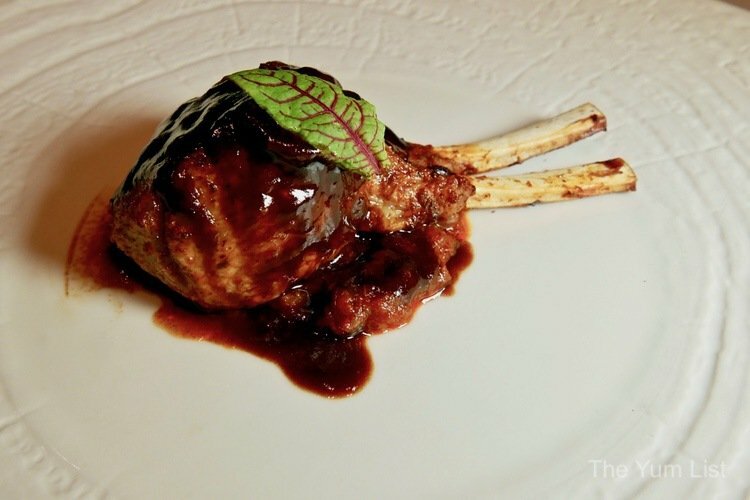 Wine pairing will add RM280++, and Akshat’s famous Liquid Degustation, RM260++. Reasons to visit Nadodi Restaurant Kuala Lumpur: Haute cuisine wrapped in paper and ribbons of Southern India and Sri Lanka, and labelled “Engaging Nomadic Cuisine.” Chef Sricharan’s new menu is more of a journey than the name suggests: This time we get heart and soul as well. Monday through Saturday from 6:00 p.m. until 11:00 p.m.
Closed Sundays. Reservations are recommended. Find a vegetarian experience at Nadodi Restaurant Kuala Lumpur here and see some of their previous menus here, here and here. A beautiful place that evokes a sense of elegance in its simplicity! Eye-catching ceiling elements with their winding forms. The pickled chops are very enticing. Classy, the food, the place, everything. Classy place. Very fusion cuisine to me. Had a meal there before, was such pleasant and unique taste profile.